But here's a much better way to treat aubergines, trust me. 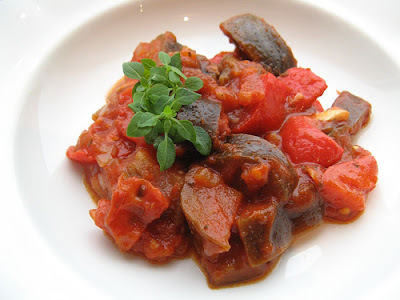 In this recipe for 'juicy stewed eggplant' adapted from St Gregory's Church's fundrising cookbook Adventures in Armenian Cooking the aubergines are added to a simple tomato sauce. The aubergines soak up the seasoned tomato sauce (healthy, virtually fat-free), and emerge half an hour later being meltingly soft and tender, with plenty of flavour. It is equally delicious when freshly cooked, but is an extremely satisfying when eaten cool hours or even a day or two later. The stew is seasoned with dried herbs - basil & mint in this case. The use of dried mint as a seasoning is especially widespread in Armenia, alongside cumin, barberries and various fresh herbs. Whereas the cuisines of the Caucasus area are typically quite meat-heavy, then Armenians also love their fruit, vegetables and salads. You can read more about Armenian cuisine here, here or here. Heat the oil in a heavy-bottomed saucepan, add onion and bell pepper and fry gently for about 5 minutes, until they start to soften. Add whole garlic cloves, season with basil, mint, salt and pepper. Saute for another few minutes. Now add tomatoes (either crushed tomatoes or tomato passata), aubergine chunks and hot water. Give it a stir, then simmer on a low heat for about 30 minutes, until aubergine is meltingly soft, but still holds its shape. Stir every now and then, adding more water, if the stew looks too dry. Season to taste, garnish with fresh herbs and serve. This is also my entry for the Vegetarian Awareness Month event hosted by Margot of Coffee & Vanilla. Yum - I love fresh mint but dried is somehow just right in this kind of dish! It's not quite as healthy as your approach, which I'll have to try, but griddling thin slices of aubergine also works really well in cutting down on how much oil you need. 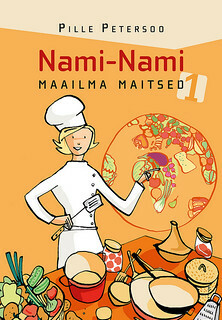 I've just been reading "What Einstein told His Cook"... Now I have another one to add to my wish list - I love the name! And I love the Armenian Aubergine stew - rolls off the tongue nicely..and sounds delish! 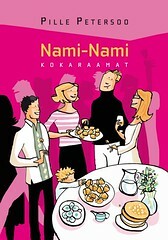 Hehehe, ei ole võimalik. Ma just eile ka tegin sarnast sööki :D (kalkuniliha oli juures). Väga sügisene kõhutäis mumeelest, samas söön baklazaani hea meelega iga kell, eriti hea ongi kuidagi tomatitega. Wonderful. I have done some of the following, trying to imitate my grandmother recipes (she is a Colombian, from the Atlantic coastal area where we have big settlements of Lebanese and Syrian immigrants). I fry the eggplants with white and green onions, few previously cooked artichoke`s hearts, garlic, and some very ripe tomatoes in olive oil. when they are already tender I add a bit of balsamic vinegar, salt and pepper to taste and leave it quiet for the ingredients to settle. I keep it in jars in the refrigerator and use it as a spread (the consistency is very soft) for focaccia and other not so tasty breads as well. This is a treat even better for many of my friends than any cake or dessert. It really gets better and better as the hours pass (Just hours, it does not last more than a couple of days). Would you share with us other Armenian recipes? I would also like to give you some of the best recipes of Colombian gastronomy. I love eggplant with mint -- it's a relatively recent combination for me, and now I can't imagine why I'd not tried it sooner. Ohjah, see sinu lause, et Kaukaasia köögid on liharohked. See PARATAMATULT toob mulle meelde minu enda esimese Kaukaasia-kogemuse. Läksime tuppa kondenspiima ja suitsivorsti sööma. I eat a lot of eggplant, and I readily admit that I don't salt it first. I can't say I've ever noticed a difference. As for it absorbing too much oil, I usually pour the oil in a bowl and use a pastry brush to apply it to the eggplant. That way I don't use too much. Your recipe sounds divine to me. I love this recipe Pille, because I lke so aubergines. Really I will try. Pille - I love that you have made this stew. I've been meaning to assemble all the Armenian recipes I have to see what the commonalities are. I like to do things like that during my down-time. Then there is the cookery book "The Armenian Table," but I won't look into buying that until Eric and I have a fixed abode. Anyway, re: bitterness in aubergines, I think it has to do with the seeds, and in my experience aubergines that weigh more than 8oz tend to be bitter. But I tend to buy ones that weigh less and don't bother with salting them. Have to say, I'm an aubergine salter! For the second reason rather than the first. Sounds fabulous - I love both tomatoes and aubergines. I salt mine when the mood takes me & when I have the time, in other words not that often! The book sounds great - it's going to have to go on my wishlist! So glad to know about this book -- it looks really interesting. Armenian food is so good -- in fact, we had it last night (I'm in the middle of writing a piece about it) and I'm going to an Armenian friend's house for lunch tomorrow. So maybe the day after that I'll make your recipe and call it The Week of the Armenians. Thanks Pille! Sophie – dried mint worked well – and you can always use fresh mint as garnish. I’ve read about the griddling approach before, but yes, thanks for reminding me! Katie – I need to check out that “What Einstein told His Cook” – quite a title!? Kärt – ootan Su blogipostitust! SalulaidSolarte – you’ve got quite a multicultural background!!! And yes, I’ll be sharing more Armenian, Georgian and other Caucasus recipes on the blog – love the cuisine of that region! Lydia – well, it’s never too late to try something new..
Susan – applying oil with a pastry brush sounds like a smart idea! 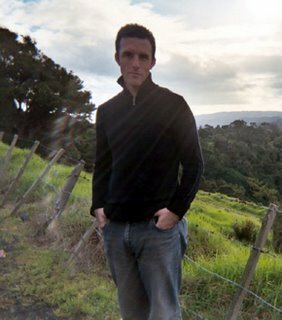 Shaun – I haven’t got “The Armenian Table” (Amazon.com link/Amazon.co.uk link) yet, but might look it up. 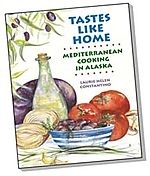 Luckily I’ve got quite a few other cookbooks on FSU cuisines, so I’ve got a good supply of Armenian recipes to try. And yes, I always prefer smaller aubergines as well. I like each chunk to have some peel as well, so smaller are better for that. Wendy – I’m looking forward to your aubergine curry recipe! Margot – I meant to email you, but got distracted with the WHB roundup. Thank you for including me! Jeanne – well, if you love both aubergines and tomatoes, then this dish should appeal to you. You can always spice it up with some chilli if you want something hotter, of course. Laurie – please let me know where to find a link to your piece on Armenian food when it’s out, ok. Thank you! Weekend Herb Blogging # 106: The Round-Up!